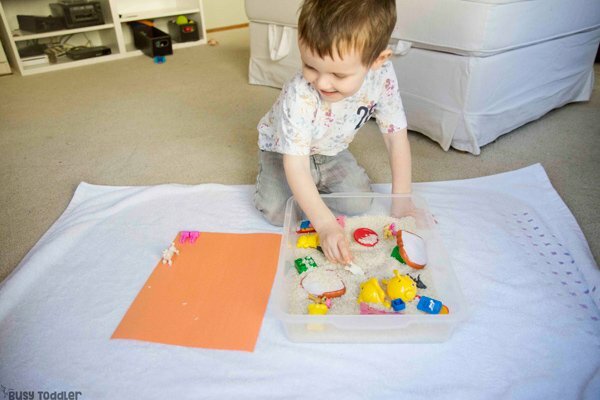 It’s a sensory bin and more… let’s see what Matching Pairs is all about. 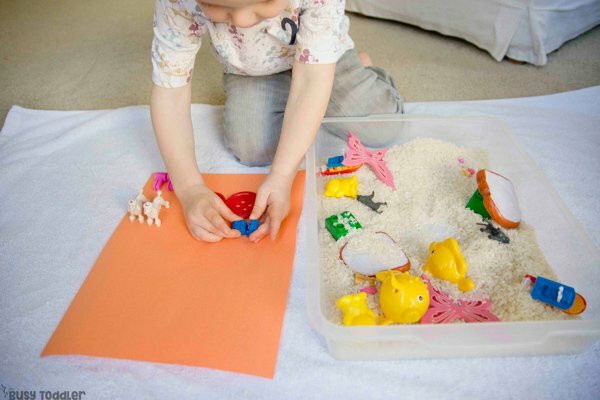 I love a good sensory bin moment AND a moment with a twist. 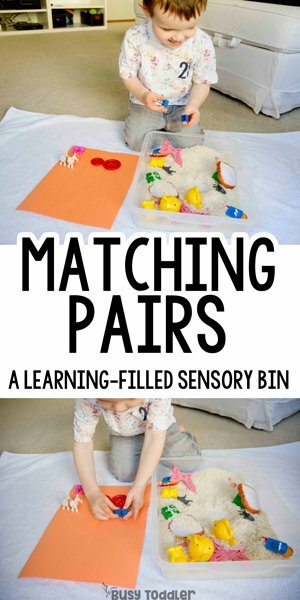 Matching pairs is one of my favorite toddler activity “gimmicks”: it’s a fun way to get kids engaging and interacting with the supplies and learning some new vocabulary. 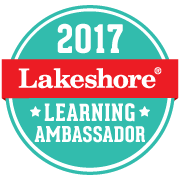 RELATED: Curious what kinds of learning activities I do with my kids? 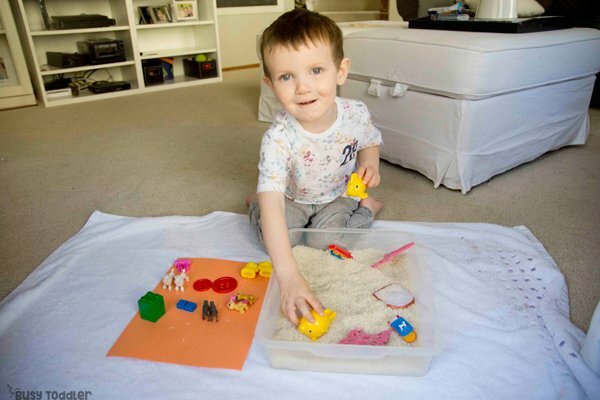 Check out Playing Preschool: my home activities program. Ok ok so this activity has a tiny bit more prep than most activities, but trust me…it’s well worth it. 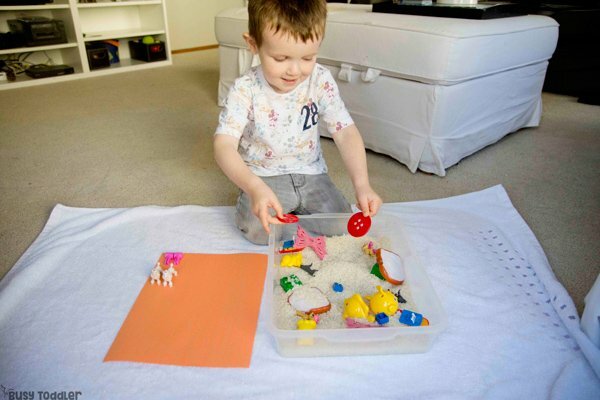 The goal of this activity is bury pairs of objects in a sensory bin and have the child dig / sort to find the matching pairs (see what I did there?). You need to start by first walking around your house, playroom, family room, kitchen, etc looking for pairs of objects. Not chokable pairs or dangerous pairs (no one needs to find buried knives) – just normal pairs. RELATED: Looking for more easy learning activities? Check this page out! 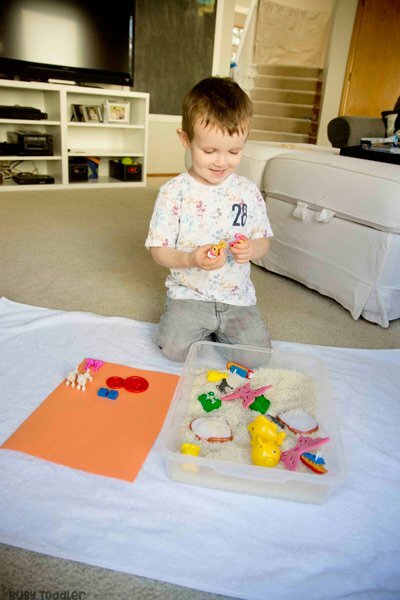 Set the pairs into a sensory bin and dump over a good sensory bin base. I like rice for this activity (this is 4 lbs and I’ve had it saved and reused in a ziplock for years). You can also use beans and cornmeal for this activity. Bury the object deep and good, set them on a towel, and place a sheet of paper next to it all. 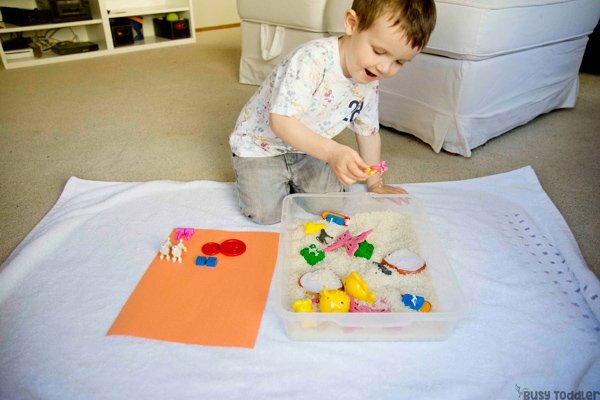 RELATED: How do you teach toddlers to keep a sensory bin tidy? Wait, why a sheet of paper? Because it defines the target area – it gives the pairs somewhere to live once they are uncovered and discovered. This gives the child somewhere definite to place the objects. How do you explain the activity? Every time I’ve done this activity, we start by looking at the bin. And I model finding one object and finding the match. When my son (2.5) was trying this activity for the first time, I could hear him repeating that to himself. 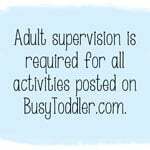 RELATED: Looking for more sensory activities? They’re right here! This silly little activity ends of packing in a lot! 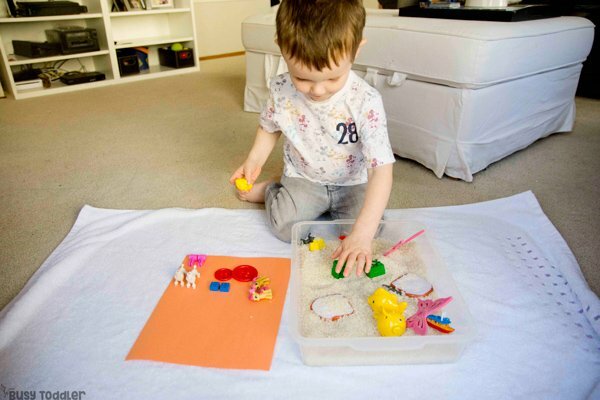 It looks so simple and so easy but toddlers learn SO MUCH from an activity like this! It might take a little extra work, but it’s so worth it! 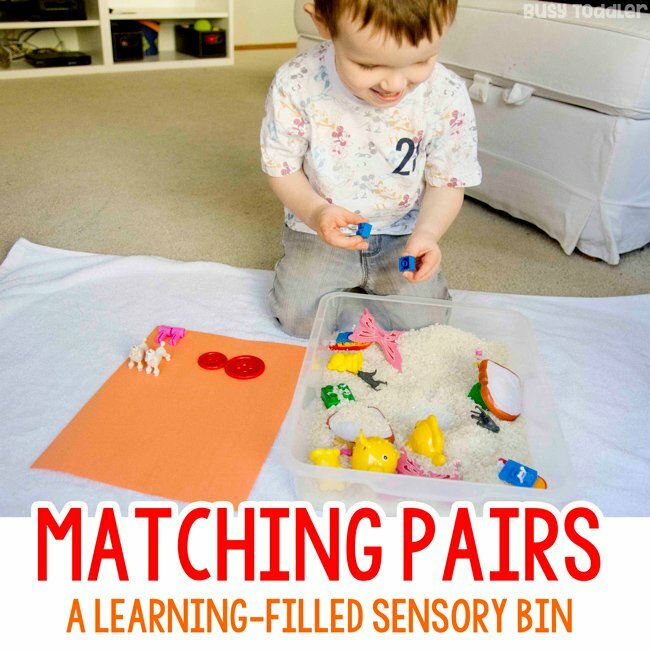 Matching pairs is a fantastic activity and a great way to start a sensory bin. 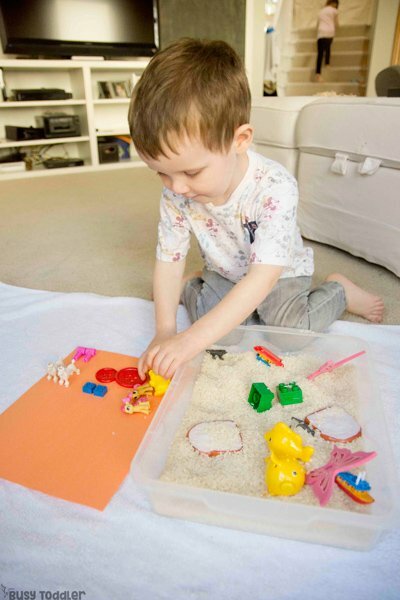 Don’t be surprised if your little one finishes finding the pairs and then goes right into independent play with their sensory bin. 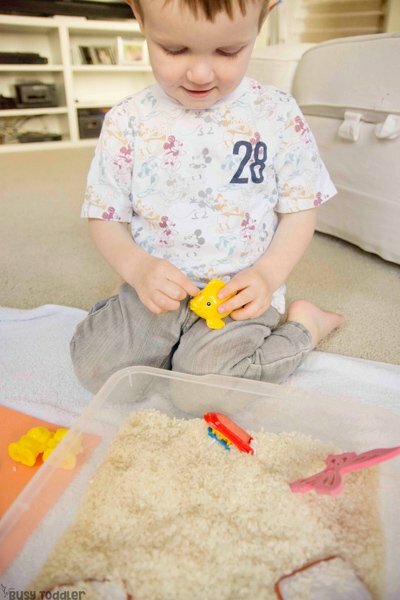 That’s the joy of sensory activities – it hooks them right in! 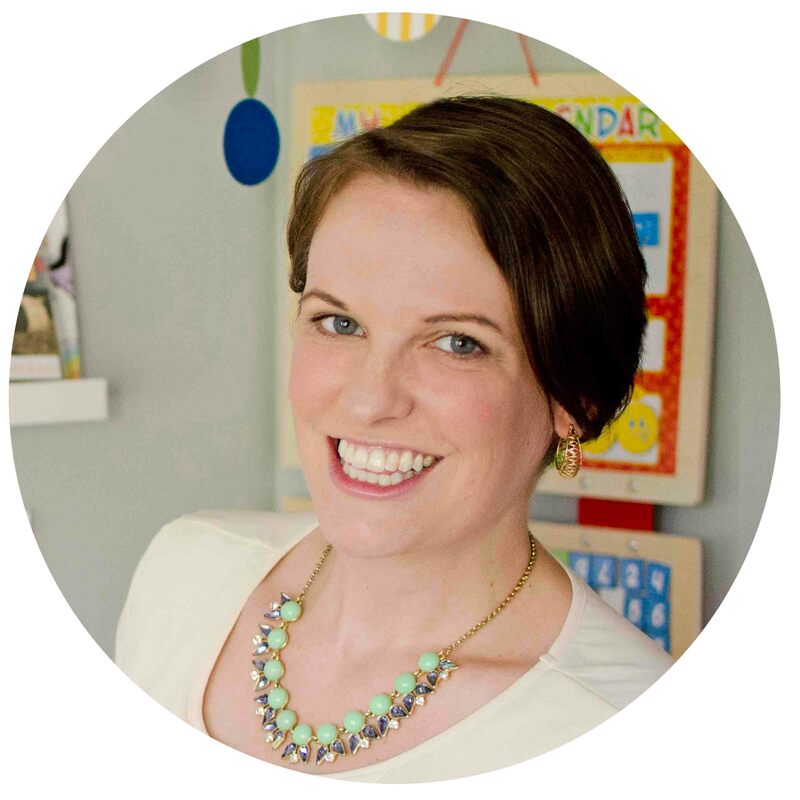 Will you try matching pairs for your toddler?